I gave the latest rev of my talk on how the social web is opening up and how the various building blocks (OpenID, OAuth, OpenSocial, PortableContacts, XRDS-Simple, Microformats, etc.) fit together to create a new social web ecosystem. Thanks to Kris Jordan, Mark Scrimshire, and Steve Kuhn for writing up detailed notes of what I said. Given that my talk was scheduled for the last time slot on the last day of the conference, it was well attended and the audience was enthusiastic and engaged, which I always take as a good sign. I think the reason that people are reacting so positively to this message (besides the fact that I’m getting better with practice at explaining these often complex technologies in a coherent way!) is that it’s becoming more real and more important every day. It’s amazing to me how much has happened in this space even since my last talk on this subject at Google I/O in May (I know because I had to update my slides considerably since then!). Yahoo has staked its future on going radically open with Y!OS, and it’s using the “open stack” to do it. 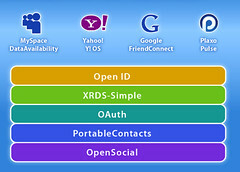 MySpace hosted our Portable Contacts Summit (an important new building block), and is using OpenID, OAuth, and OpenSocial for it’s “data availability” platform. Google now uses OAuth for all of its GData APIs. These are three of the biggest, most mainstream consumer web businesses around, and they’re all going social and open in a big way. At the same time, the proliferation of new socially-enabled services continues unabated. This is why users and developers are increasingly receptive to an Open Web in which the need to constantly re-create and maintain accounts, profiles, friends-lists, and activity streams is reduced. And even though some large sites like Facebook continue to push a proprietary stack, they too see the value of letting their users take their data with them across the social web (which is precisely what Facebook Connect does). Thus all the major players are aligned in their view of the emerging “social web ecosystem” in which Identity Providers, Social Graph Providers, and Content Aggregators will help users interact with the myriad social tools we all want to use. So basically: everyone agrees on the architecture, most also agree on the open building blocks, and nothing prevents the holdouts from going open if/when they decide it’s beneficial or inevitable. This is why I’m so optimistic and excited to be a part of this movement, and it’s why audiences are so glad to hear the good news. PS: Another positive development since my last talk is that we’re making great progress on actually implementing the “open stack” end-to-end. One of the most compelling demos I’ve seen is by Brian Ellin of JanRain, which shows how a user can sign up for a new site and provide access to their private address book, all in a seamless and vendor-neutral way! Excellent. These slides will come in handy for continuing to flesh out and tell the story! I am very impressed at what you are doing. This whole portable contacts is absolutely amazing. I just tried the Janrain demo. Wow, I am totally blown away at how well it worked. Every piece of the open web puzzle worked exactly as described. Simple Secure and complete, very nice work. Congrats to all of you for your very fine and very hard work. I think your last sentence should be warning to you: signing up for a website and giving up your address book seamlessly? Why don't websites just give me their code and let me keep my address book private, the way it should be? I don't understand why the Web is thinking that the bass-ackward to do things is the proper way. I think you misunderstood what's happening here–you *do* get to keep your own address book and keep it private, and you can then opt-in on a per-site basis to share access to your private address book, so services can do interesting things with your data, but you keep full control and ownership over your data. That hasn't really been possible before, but that's exactly how things will work once the social web is truly open. Sites don't need access to my address book to do interesting things with it. They just need to give me their code so that *I* can do interesting things with it. That's a truly open web, not the other way around. If I give a site access to my data, I've lost control of it – period. One just needs to look at the constant violations of privacy with Facebook as the prime example. There's a fundamental disconnect with all things Web 2.0. A reversal of when the subjective and the objective (in the Jungian context) is appropriate. There are only a few reasons why one needs the “objective” (shared/compromised/external – websites) when the Internet is based on subjective (private/personal/internal) networking. There are few things that web 2.0 companies do today that couldn't be achieved by distributing the code and using P2P technologies amongst the users. Of course, they wouldn't be able to monetize that. Hence why it hasn't happened. Thanks for your thoughtful response. I'm especially thankful because my argument essentially seemingly negates your business model (and that of the vast majority of web 2.0 properties) and can be seen as a personal attack. It could easily develop into a fundamentalist war of server/client vs p2p. I see this trend towards cloud computing as very much a web 2.0 phenom (maybe more like a 2.5, given how recently it has built up to the point of buzzworthiness). After all, the cloud wouldn't be necessary if all of these remote silos hadn't been created in the first place. The cloud is a band-aid. Yes, it's very convenient for the developer to code for one computer as opposed to tweaking it for millions of exceptional ones, but I think that points out the larger problem of end-computers. It's also important to note that it's easier for the developer, but ultimately their ego-centric needs [and note I use this in the Jungian context, not the connotative insult: ego-centric here refers to “my POV prevails and is correct by default”] are superfluous in a consumer-oriented market. The customer is king, not the developer. I see ajax as yet another shoehorn of a webpage into an app, and that it's bassackwards as well. Gears is wonderful in theory (MySpace is already using it for their email system – strangely progressive of them). Everything should be “geared” so that I always have a local (primary) copy of my data, and that it's only shared when I need a remote and objective “space” to do something that directly querying my peers cannot achieve. There are very few things that can't be done p2p. In a p2p architecture, there's no need to centralize the database (there's only one database – mine, and temporary ad-hoc ones on the server that don't need to be maintained), code updates are distributed effectively, and you don't need to worry about overloaded web servers when most data is pushed and pulled amongst the users directly. There's nothing about a p2p architecture that prevents a user from being able to access data from anywhere, if you use a remote storage service such as xdrive or the mythological gdrive that acts as your p2p proxy. Need remote app processing because your iPhone can't handle the load? That's where HaaS comes in, and I think Amazon is showing its viability. This model satisfies one basic theoretical concept in both database and hypertext design – write once then refer (backups notwithstanding). My problem with such groups as DataPortability is in the name – data isn't supposed to be portable! Standardized, yes. Cached, sure. Copies made? Nuh-uh. The real key to future development of the web is recognizing when something is more appropriately done in a subjective or objective manner. That is value added, not value hyped.